Here are my last Christmas cards for this year,(I think) and all the products used are stampin up from their Christmas catalogue – so,woodland embossing folder,peaceful pines stamp set, perfect pines die set, and the father Christmas image is from the home for Christmas designer paper. I always wonder what to do with myself in the craft room after I have finished my Christmas cards – it takes me a little while to settle back into the rythym – maybe that’s just me or do other ladies feel that ? Today I went and saw my knee specialist, and thought I would be able to go back to work next week, but he said no, not for two more weeks, so I will be returning the week of Christmas. It was a big job he had to fix – split cartlidge, and needs a bit longer to heal. Thats OK – I get to spend a little bit of time in the craft room before I go back! til tomorrow…. 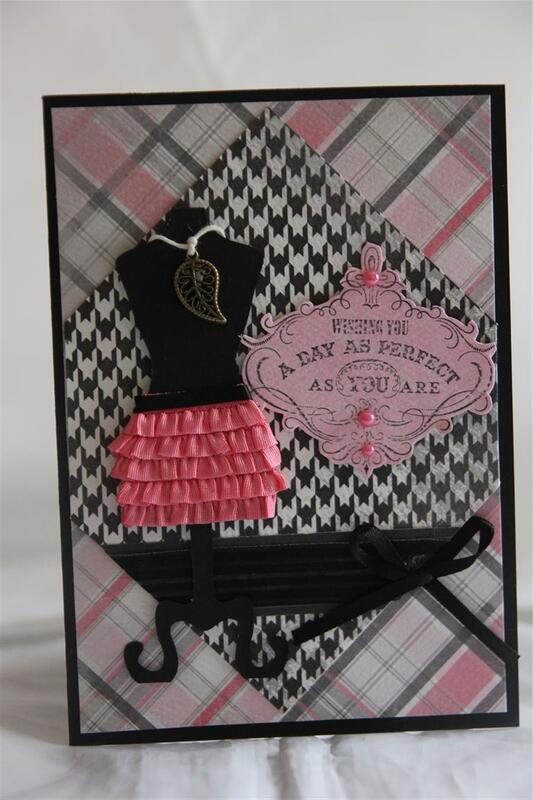 Anoher card made from Authentique devoted patterned paper, this time it was for my sons girlfriends 21st birthday. 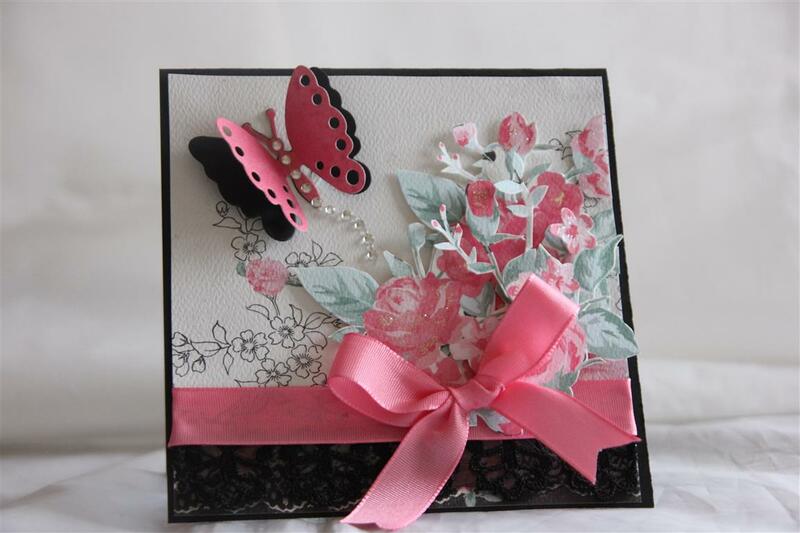 The cardstock is from stampin up, and I added a row of lace and pleated ribbon, and a bow at the bottom of the card, and a key at the top. We have a wedding today, in the botanic gardens which should be lovely as its a perfect day here, and then off to the town hall for the reception. Looking forward to the day, I must go and prepare myself! til tomorrow….. I saved the best for last ( I think anyway – this is my favourite), and I have put this paper away for now while I concentrate on chritmas cards for a little while.I did lots of fussy cutting for this one, and die cut a butterfly – spellbinders – added some rhinestones and a gorgeous satin ribbon.Paper is Authentique Pretty. 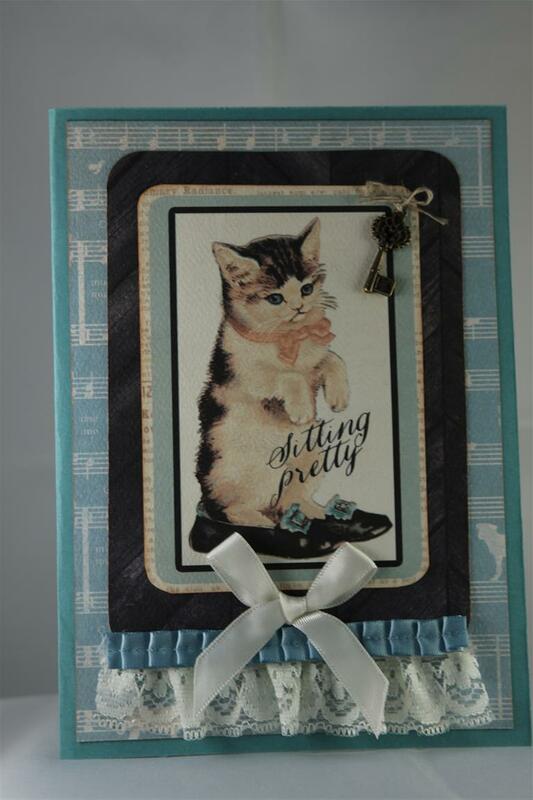 Early post today as I intend to get some cards done this afternoon before it gets too bitterly cold in the craft room. Til tomorow…. very quick post tonight , still with the Authentique Pretty paper, and another dress form deign. This time I used stampin up ruffled ribbon to dress my dress form,and the stampin up vintage verses stamp, and more ribbon for a bow. I used a metal charm around the top of the dress form. til tomorrow…. Sorry I missed last nights post, but we are still having random internet issues. still using Authentique Pretty collection of papers,I also used a dress form die ( mine is from stampin up, but most die companies have one of these! )and wrapped some lace around it, and glued a string of pearls around the neck area.I folded back a corner of the layered square and pinned it with a kaisercraft brad,and added some black lace there to peek through. A ribbon bow and some ruler printed trim ( got it and the string of pearls from K-mart) to finish off this design. Til tomorrow…. 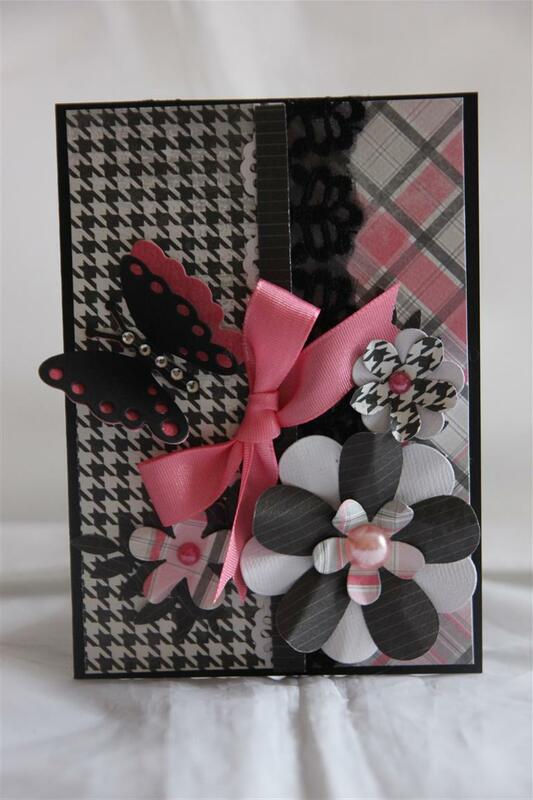 I have used punches and dies on this card – Couture creations retro flower die, spellbinders butterfly die, ek success border punch and martha stewart leaf punch. the paper is Authentique Pretty, and I also added some lace, ribbon and bling.Today has been all about using up last years christmas paper, and I have come up with a few ways of using all those annoying strips, so will share them with you next week after nathan and I have done the photo’ing! Til tomorrow….